July 24, 2014 – Hey, everyone! Kristen Doyle here from Dine and Dish to show you one of my favorite tilapia recipes! Seafood, especially shrimp and tilapia, is what saves our family on some of those crazy busy weeknights. There are so many simple recipes out there for seafood that are quick, easy and kid friendly. When time is tight, and I need a good, nutritious meal on the table in a hot minute, 99% of the time I turn to some kind of seafood. In our household, tilapia is one type of fish that I can get my kids to eat every time. For some reason, the mild taste appeals to the younger crowd and even non-seafood lovers. Boneless Tilapia from ALDI comes in individually-sealed pouches too, so you can take out of the bag exactly how many fillets you want and store the rest conveniently in your freezer for the next recipe you want to cook up…which brings me to my next point. Tilapia can be used for so many things…and I love that I can make a batch of Parmesan Tilapia and have it by itself one night, then reheat it the next night for a tasty fish taco recipe. I simply double the recipe below, minus the mushrooms, take the leftover baked tilapia, heat it up, and then place in a warm flour tortilla with cheese and shredded cabbage! Now you have dinner two nights in a row, with next to zero effort. Tilapia is such a time saving, versatile ingredient! Mushroom-Topped Parmesan Tilapia is a dish that’s fancy enough to serve for company, but also easy enough for a quick weeknight meal. If you have kids who aren’t mushroom fans, simply leave them off. I promise that either way you serve it up, their plates will be left clean! Preheat oven to 350°F and lightly coat a 9×13 baking dish with cooking spray. Once the oven is heated, place tilapia fillets in the baking dish and bake for 10 minutes. Meanwhile, in a small bowl, with a fork, blend together parmesan cheese, butter, mayonnaise, salt, black pepper and crushed red pepper. Once tilapia fillets have cooked for 10 minutes, remove from the oven and spread Parmesan/mayonnaise mixture on top of each fillet. Return to the oven for an additional 5-10 minutes, until tilapia is cooked through and easily flakes with a fork. While tilapia is cooking, add fresh mushrooms, chicken broth and a sprinkle of salt to a small sauté pan. Sautée over medium heat for approximately 8 minutes, stirring occasionally, or until mushrooms are soft. Remove cooked tilapia from the oven. 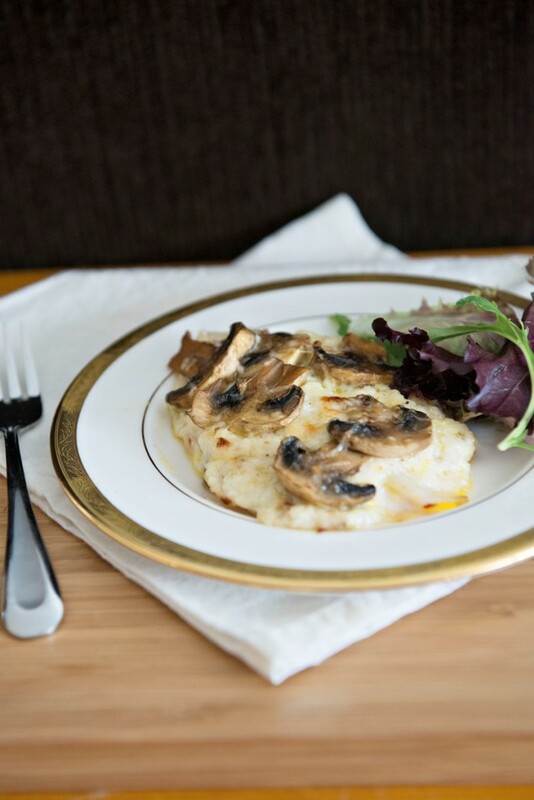 Using a slotted spoon, spoon mushrooms over tilapia fillets. If desired, sprinkle a small amount of Parmesan cheese over mushrooms. Turn your oven to broil and make sure your oven rack is in the very top slot. Place baking dish with tilapia under the broiler for 3-5 minutes, or until cheese starts to turn a light brown color. Remove from the oven and serve warm with fresh garden greens. *Price and availability may vary by store. Recipe and photos by Kristen Doyle of Dine and Dish. A friend of mine told me that she heard that in 2015 a store will be opened in Killeen, Texas. Is this true? I have written several times about our area (Killeen, Fort Hood, Copperas Cove). Being a military community there are many Germans and people who have been in areas that have Aldis. This would be an excellent business opportunity. I so hope my friend heard correctly, if not, please do check into this area. Thanks for asking, Gabriele! We’re expanding in many markets and will announce new Grand Openings here: http://on.fb.me/1f6Uk1W. How do you shred grated cheese? Hi Connie, thanks for asking! The Mushroom-Topped Parmesan Tilapia recipe calls for grated cheese. Thank you for bringing this to our attention and we have updated the post accordingly. I went to Aldi on Monday, for the first time. I drove 25 minutes to the one in Beaumont, CA. because of the good things I had heard about Aldi. One of the things I bought was a bag of Sea Queen Tilapia Fillets. There are supposed to be 4 individually wrapped fillets but there were only 3. I’m just wondering if you have had other complaints about that or is this an isolated incident? Hi Teri, we’re sorry that you were short one fillet! We’re more than happy to replace the product. Bring the package and any unused product to your local ALDI store manager and they will help you out!